For GenCon Oz 2009 I tried to get four people to design one rpg in 3 hours, and it sort of worked. For 2010, I knew I had to up the ante, and by that I mean “steal from a brilliant television show”. This Iron Game Designer was born, although sometimes called Iron Chef Game Designer because otherwise people don’t know what the Iron means. It works exactly like Iron Chef, of course: tabletop game designers are given a theme ingredient, a bunch of materials and two hours to build a board game entirely from scratch. While more and more game design competitions have sprung up over the last few years, this one still feels pretty unique, because of that tight time scale and the lovely pageantry we adopt. We do have our own Chairman Kaga, you see (see figure one, from 2015). GenCon 2010 ended up being cancelled so we ran it at Uprising, the con that sprung up to replace it (and would late become the now five-year running amazing Go Play), and were able to harness some of the GenCon sponsors to give us prizes. It went spectacularly well for a teeny tiny con event for eleven people. The theme was “The End of the World” and four teams made four vastly different but amazing games. Nathan Russel was part of a team that made the winning game “Come With Me If You Want To Live”, but it doesn’t appear to be on his site any more. It was so successful we thought we might do it every year, or take it on the road, and I even set up a website for it. But life, as they say, finds a way of interrupting those plans of men and mice. But a good idea never dies so in 2015 we came back to Go Play. Five years has changed the game-designer environment entirely in Brisbane, and the game-player one as well. Board games are now ten times more popular, and we have cafes and clubs and companies and events showing off our new products from our own game designers and publishers. And with them also came newbies and beginners and computer game designers and all sorts of people, driven to test their mettle, and surprise themselves. 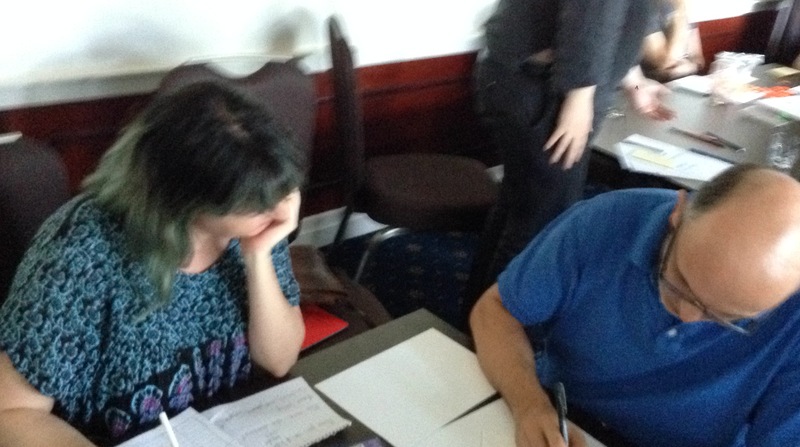 I lucked out with my judges: none my celebrity guest judges (such luminaries as local federal member Graham Perrett and author John Birmingham) but that produce a triumvirate of awesome that spanned three different kinds of brains and kinds of gamers. Kevin Lowe is a rules maestro who sees solutions quickly and demands perfection, Sarah Smith is a professional game designer who lives and breathes her passion from the first idea to the game hits the shelves, and Jess Wheelock is a newbie with little experience in games beyond social fun like Cards Against Humanity. Each would be using my scoring system, over four categories – Robustness, Engagement, Ingenuity and Use of Theme. Chairman Kaga announced that the theme ingredient was “HOME IS NOT SAFE” and the time began. Suddenly, deep thought broke out. Chins were rested in hands across a wide area. Instantly I learnt something: one of the most important factors is what is available. Last time I had placed A2 and A3 sheets of cardboard on every table; everyone made a board game. This time I left those sheets at home by accident and everyone made a card game. The Great Black Box has many things in it though, and the cute rubbers the Rule and Make guys grabbed for game pieces may have influenced their choice of theme; I know the (fake) bullet casings certainly influenced the idea of French Resistance’s setting (see below). The contents of the Great Black Box plays a part as much as the theme, sometimes. Which is why I put more into it than just cardboard, dice and pens. Without chins on hands, how we would design games? We couldn’t, I feel. 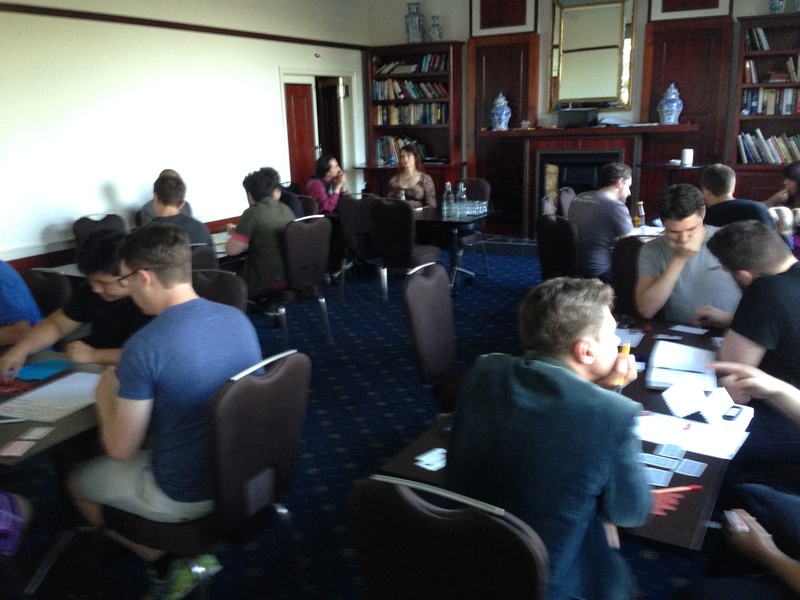 Unlike last time, these designers knew very well the importance of playtesting and review and before the last half hour the games were being crunched as competitions, and over the hubub of design came the yells of success and the curses of low die rolls. Cards were sleeved. Decks were shuffled. I tried to scare them by telling them they had fifteen minutes left but they were beyond such things now. The adrenaline was up. The finish line emerged. The confidence in the room was palpable. Where there had been nothing, there were now games. Time was up. The judging began. With just ten minutes to pitch to each judge, the teams learned some new lessons: not about design but about the art of pitching, and tailoring those pitches to different audiences. Exit interviews expressed the confidence I had sensed, and encounters with judges raised that further – the games had met other people, and the games had survived that contact. Food and drink was brought in – and people began to share their games with others while they waited. Money was collected allowing us to cover all our costs, which ensures there will be a next Iron Game Designer – The Great Black Box doesn’t fill itself. At last the judges came forth with their scores tallied and their decisions final. But what games were made and who took home the title will be in my next post. And following after that, I will be cutting together the fifty-something short films, interviews and mid-design conversations to make something that actually looks like Iron Chef. Exciting things still to come!